International law is a social construct crafted by human endeavour to achieve or at least contribute to the achievement of goals perceived to be valuable or necessary to effective social relations. In effect, international law is no more than a facilitative process and so cannot have answers and conclusions of its own other than what lies within the ambitions of those who define the limits of the process. 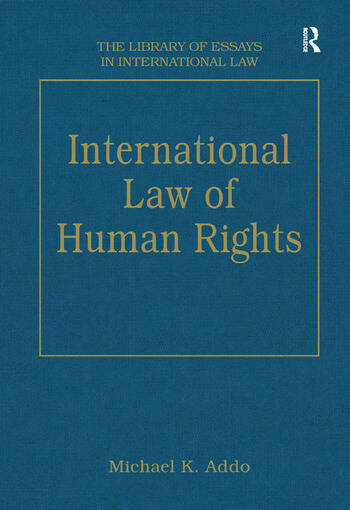 The essays collected together here reveal how international law facilitates the achievement of the long standing ambition of turning human rights ideals and rhetoric into reality. Contents: Nature: Human rights genealogy, Ruti Teitel; The concept of human rights in international law, Anthony D'Amato. Politics: International human rights and cultural relativism, Fernando R. TesÃ²n; The ideology of human rights, Makua wa Mutua; Cultural relativism and human rights, Jack Donnelly; Rethinking the 'universality' of human rights law, Dianne Otto. Implementation: How is international human rights law enforced?, Harold Hongju Koh; Towards a theory of effective supranational adjudication, Laurence R. Helfer and Anne-Marie Slaughter. Exemptions: Legal differentiation and the concept of the human rights treaty in international law, Matthew Craven; Human rights treaties, invalid reservations, and state consent, Ryan Goodman. Challenges: Globalization and the convergence of values, Alex Y. Seita; Globalization and human rights, Robert McCorquodale with Richard Fairbrother; Name index.